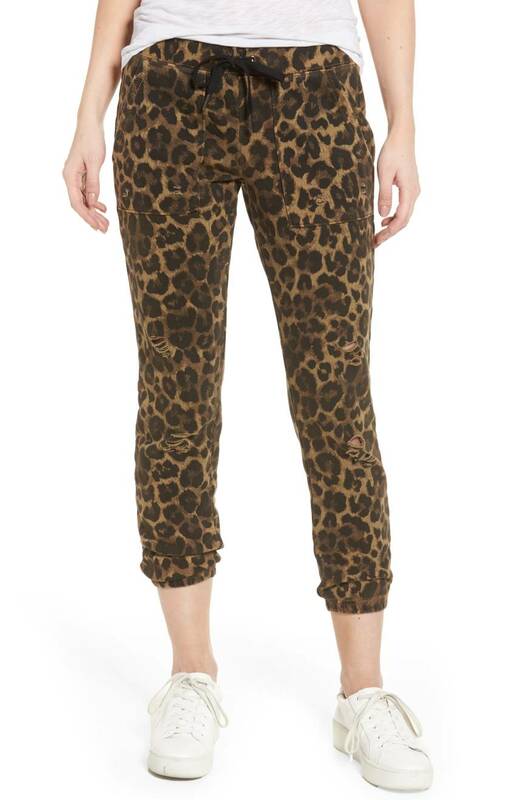 I was off leopard prints for a while, but I’m feeling them again, I think because I keep seeing them on items I really want, like these sweats. I could do without the pre-distressing—I can destroy my own clothes, thank you very much—but still think they’re pretty great. This jacket is also super-distressed, and it also costs way more than it should, but I am not a little obsessed with it. Why not leopard print sunglasses? 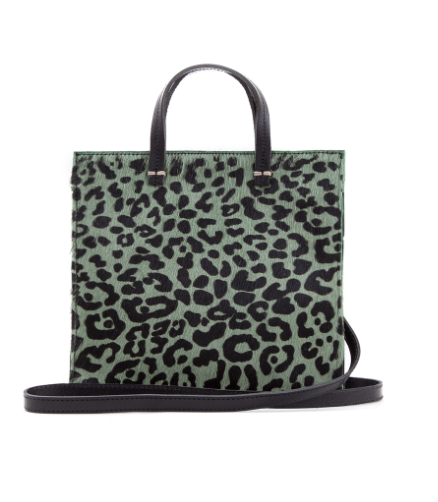 Leopard prints in fun colors are always a delight, and this mini-tote from Clare V feels both totally cute and nicely sophisticated. OK, I realize I’m getting way ahead of the seasons on this one, but this faux fur peacoat is just divine. Twenty years ago, I bought a faux leopard swing coat and wore it a couple of times. Then I gave it to my wildest girlfriend, who is about to turn 80 and is still wearing it. It takes the right woman. Twenty years ago, I bought a faux leopard swing coat and wore it a couple of times. Then I gave it to my wildest girlfriend, who is about to turn 80 and is still wearing it. It takes the right woman. It does indeed. My great-aunt wore leopard beautifully – she wasn’t a pretty woman (my grandmother, her sister, was the pretty one), but she was so damn striking and cool. I wear leopard in her memory! It does indeed. My great-aunt wore leopard beautifully - she wasn't a pretty woman (my grandmother, her sister, was the pretty one), but she was so damn striking and cool. I wear leopard in her memory! This is totally off-topic, please forgive me…but sending love to any and all trans GOACAS today. You are not a burden and your civil rights are not a distraction. We will fight for you. This is totally off-topic, please forgive me...but sending love to any and all trans GOACAS today. You are not a burden and your civil rights are not a distraction. We will fight for you. Playing “In the Navy” a lot today. Playing "In the Navy" a lot today. I once bought a faux leopard fur three-quarter swing coat for my Pebbles Flintstone costume at Halloween. My son wore it as his “Macklemore Thrift Shop” costume for another Halloween when he was in high school. And then I saw a male high school student in Reykjavik wearing one as daywear. It’s time to haul it out again this fall. I paid next to nothing for it at a spring clearance sale, but it has high fun-factor value. Very good for starting conversations, too. I once bought a faux leopard fur three-quarter swing coat for my Pebbles Flintstone costume at Halloween. My son wore it as his "Macklemore Thrift Shop" costume for another Halloween when he was in high school. And then I saw a male high school student in Reykjavik wearing one as daywear. It's time to haul it out again this fall. I paid next to nothing for it at a spring clearance sale, but it has high fun-factor value. Very good for starting conversations, too. The Denver Post is reporting that the military’s transition-related medical costs are $2.4 to $8.4 million a year. But it spends $84 million a year treating erectile dysfunction, with $41 million of that going to Viagra alone. The coat link doesn’t seem to be working. The coat link doesn't seem to be working. I fear it sold out, Judy. 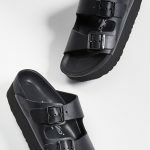 I can’t find it on the Barneys site at all now. I fear it sold out, Judy. I can't find it on the Barneys site at all now. Do you remember the brand by any chance? 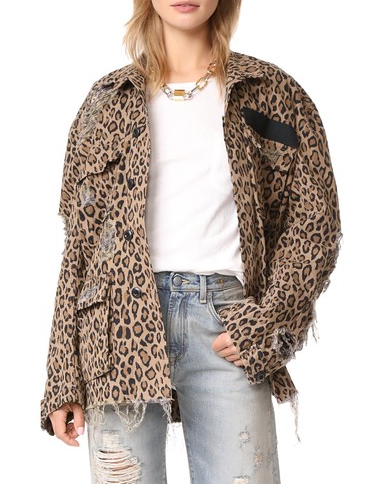 I’ve been on the hunt for a leopard coat and that one was truly gorgeous! Do you remember the brand by any chance? 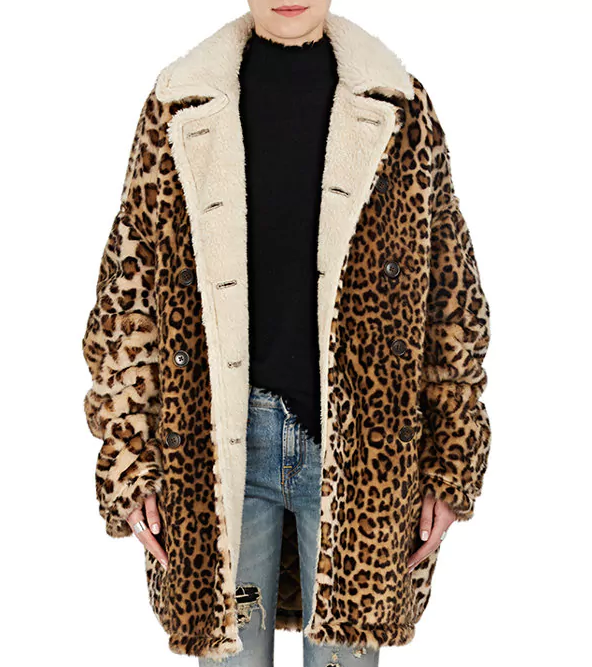 I've been on the hunt for a leopard coat and that one was truly gorgeous! I bought a vintage leopard coat at a thrift store back in 1991 in San Francisco. It was amazing. Since then I’ve always owned something with a leapard print or include several pairs of underwear. 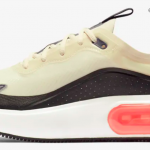 Hey, they go on sale and I like the fit. So sometimes it may appear as though I’m wearing the same pair of underwear everyday for a week. In my world a leopard print is basically a neutral. I bought a vintage leopard coat at a thrift store back in 1991 in San Francisco. It was amazing. Since then I've always owned something with a leapard print or include several pairs of underwear. Hey, they go on sale and I like the fit. So sometimes it may appear as though I'm wearing the same pair of underwear everyday for a week. In my world a leopard print is basically a neutral.